Productions rack mounts are units that are designed using CAD software located at our local Metal Master. Once the design stage is complete, there is a preproduction run make to check out all the details, two or three units are produced. Once the inspection has passed the test, it’s time to do a production run. The CAD software instructions is sent to large punches and presses that punch sheets of metal into a pattern that once bent to shape become either a rack mount rack trays or front panels. There is a minimum run of 50 units required to be cost effective. The set up charges and design cost has to be spread over those 50 units. We must be selective as to which radios are popular enough so we don’t end up with a warehouse full of slow moving inventory (we call is scrap metal). We are always interested it which radio are selling well and test the market to confirm which radios that operators will be most interested in rack mounting. We have make some questionable decisions in the past, a couple of rack mounts were so slow moving, it took 5 years to sell 50 units. We have also hit a few good ones. Novexcomm's Collins model RM351-1 and RM351-2 rack mount kit designs allow the user to mount their Collins in our rack mount without removal of the original Collins' case. Our design is different than the original Collins 351R-1 & 351R-2. Our rack trays are identical, the only difference is the front panel. Once the front panel is installed you can't tell them apart. In addition to above, our units are less costly and available for immediate shipping. Unit cost list is $139.95 but sold direct for $109.95 plus S&H of $18.50 for one unit. Treat your self for the holidays by rack mounting your Collins gear and protecting your investment. NovexComm is pleased that The Collins Radio Club has endorsed our new products. Some users have expressed concern that our newly designed Collins rack mount kit allows radios to remain in their original cases and may cause heat problems. If that is a real concern to anyone, then there is nothing that says you have to leave the radio in its' factory case. It's the user's option to remove or not to remove the case. There is a 2" space between the top of one Collins case and the bottom of the rack tray over the lower unit, plenty of room to place a muffin fan. We also added more air flow slots than what the Collins had. Many Collins users stack their radios on top of each other and don't seem to be concerned about heat. 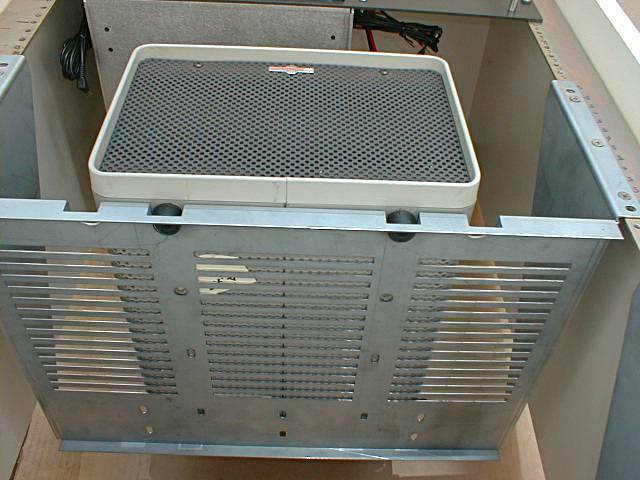 Many users use muffin fans to move the air out of their rack enclosures. Any other questions? Let us hear from you. Contact Us Today. Radios: R5000, 140, 430, 440, 450, 570, 660, 670, 680, 690, 711, 811, TS2000. Radios: FRG100, FT77, FT707, FT747GX, FT757GX, FT840, FT857, FT890, FT900. We are looking into producing generic rack panels and trays so the user can design and cut their own special radio rack mounts panels. We will offer the panels, made of .090” aluminum for easier cutting (than the .125” used in our standard rack mounts). The trays will be the maximum width, about 16.75” wide, 5.25” and 7.0” high and about 12” deep. The panels and the trays will be offered separately but are made to be compatible should the user wish to have a complete rack mount. The idea is the user can order just the tray as a shelf for his radio and may not want to add a panel. In some installations the user may want just blank panels to fill out the spaces in his cabinet and not want any tray(s). The 5.25” tray will be made from 16 gauge Paintlok steel and the 7” tray will be 14 gauge Paintlok steel. These racks will support up to 75 and 100 pounds respectively.